The main challenge that also lies ahead of academic institutions is preparing students for future jobs that don't yet exist, said Dr. Ahmad bin Abdullah Humaid Belhoul Al Falasi, Minister of State for Higher Education on the sidelines of the 29th edition of the Gulf Education and Training Exhibition (GETEX). "We witnessed this year a larger number of students who were sent abroad with scholarships for higher education, which increases connection to workplace and the employability for expats and Emiratis," said Belhoul. "The challenge now is finding stronger link between the outcomes of higher education and the workforce," he said. To address this gap, Modul University Dubai has announced a one-month paid internship for students enrolling for any of its undergraduate and Master's programmes. The university will send students for internships with its corporate partners including banks, insurance companies and industrial manufacturers to prepare them for the workplace. "Instead of granting them gifts or scholarships for joining, we are investing in their future and we have seen a strong demand doing so," said Zaid Maleh, the university's managing director. He added that the internship will not only enhance students' employability, but also offer operational insights at Dubai's institutions. Over 140 students are currently pursuing various courses at the university - the only institution specialised in the tourism and hospitality sector. Maleh added that the university is also introducing new sustainability in management and development programmes, besides ones in renewable energy and sustainable tourism to prepare students for future jobs. New bachelor fields in entrepreneurship and digital marketing are also seeing a strong demand. Abu Dhabi University, which is opening a new branch in Dubai Knowledge Park with 14 new postgraduate programmes in business, engineering and international relations among other fields, is also focusing on equipping students for recruitment in an ever-changing workplace. Among the new programmes that will be offered in its Dubai branch starting Spetember is the Master of Strategic Leadership, Engineering Management, and Master of Science in Sustainable Architecture, and Master of Information Technology. Charles Diab, director, university advancement, said programmes equipped with technological advancements increased graduates' placement rates in workplace or post grad schools by 90 per cent. He noted that these academic programmes are designed to cater to skills needed in the workplace. The university, which currently has about 7,000 students from 70 nationalities studying in its Abu Dhabi and Al Ain campuses, also offered a digital marketing programme in addition to teaching students to implement technology in business and robotics and mobile apps in engineering. "Technology, innovation, entrepreneurship are the buzz words of the future. We have to equip our students on free and independent thinking," said Diab. 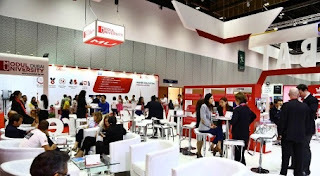 Anselm Godinho, the managing director of International Conferences and Exhibitions, GETEX's organiser, said one of the main aims of the event is to introduce segments that involve students with activity-based education outside classrooms. "We want to help students get more involved in the type of education that would get them jobs," said Godinho. He added that as the job market becomes competitive, more opportunities open in postgraduate education to help graduates climb the ladder. While the UAE has witnessed an increase of future-specific nuclear and space programme - about 20 new programmes - have been introduced during GETEX - Godinho said there must be a link between the industry and universities. "Industries will have to make sure their employees are feeding into the market growth, and this won't happen if both sides didn't work together," he said. "While that link isn't happening now due to the disconnection between public and private, it will happen overtime. It is inevitable," he said.